With less than three months to go before SEMA, it’s time to start getting serious about travel before all the convenient hotels and flights fill up. But before locking in your reservations, don’t forget that the afternoon of Monday, Oct. 30, has been bolstered with three new Society of Collision Repair Specialists courses. Any of these would be useful to a shop owner or manager, and estimators and technicians might also benefit. Repairer Driven Education runs Oct. 30-Nov. 3. The SEMA Show proper runs Oct. 31-Nov. 3. However, if you reach Vegas earlier in the day Monday or blow in Sunday night, SEMA has some events for you as well. From 8:30-9:30 a.m. Monday, Oct 30, mentalist and magician Max Majors will entertain the audience but also teach a little about body language for better communication. “He will entertain and inform you with a mixture of unbelievable mind reading demonstrations, paired with real world take-aways that you can put into practice immediately!” a SEMA description of the free course states. “You are using up to 10,000 nonverbal cues in the first minute of interaction to form a SNAP impression that determines how you’ll interact with that person in that particular situation and you sending cues that determine what they think of you!” the description of the free course states. 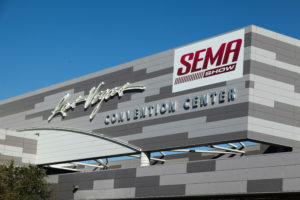 SEMA also has many other educational events Monday, some geared specifically to its custom automotive membership and others that seem relevant to a general aftermarket business leader. Their 11:15 a.m.-12:15 p.m. session on leveraging data on vehicles in a market might be of particular interest to shops wondering what OEM certifications would be worthwhile or simply what equipment and training to buy to keep pace with customers’ vehicles.